NILES, OH - The Mahoning Valley Scrappers are excited to announce that they have partnered with Vlad Pediatrics to host a three-day Youth Baseball Camp July 30 through August 1. 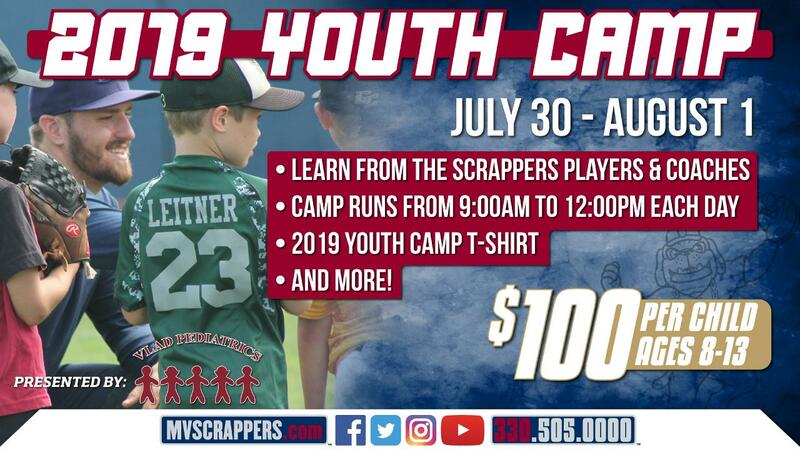 The Scrappers Youth Camp provides kids ages 8-13 a once in a lifetime opportunity to learn from some of the very best players in Minor League Baseball. All exercises and instruction will be taught by Scrappers players and coaching staff, and will focus on baseball fundamentals, sportsmanship and healthy competition. Boys and girls of all ability levels are encouraged to participate and learn from the Scrappers players and coaches in a small group setting. Camp registration includes instruction each day from 9am until 12pm, a ticket to the Thursday, August 1st Scrappers game against the Aberdeen IronBirds, on field recognition prior to the August 1st game, a camp t-shirt, and a lunch the final day of camp. To ensure that your child receives individualized attention, the Youth Baseball Camp has been limited to 100 campers and early registration is highly encouraged. The 2019 Scrappers Youth Baseball Camp is $100 per child. To register for the 2019 Scrappers Youth Baseball Camp, click here or call (330) 505-0000. The Scrappers Home Opener is set for Sunday, June 16 at 6:35pm against the Batavia Muckdogs. Ticket memberships and ticket packages can be purchased now at mvscrappers.com, the Chevy All Stars Box Office at Eastwood Field or by calling (330) 505-0000.